This was definitely a pleasant surprise. I wasn't sure about it at first. 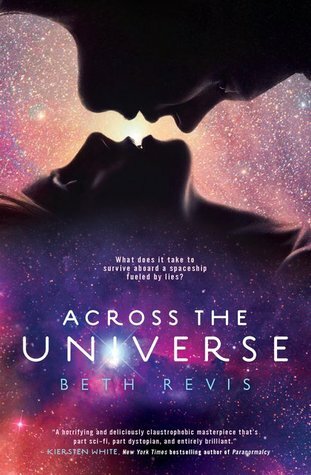 A YA Sci-Fi/Romance? This was new and I had to read it. The love story between Amy and Elder is kind of the back burner of this epic story, but the adventure and the mystery driving the plot was amazing. Think The Giver + Space + Unwind in the awesomest context you can think of. Elder is going to be the leader of the ship Godspeed but he soon discovers that there are secrets hidden from him when he finds frozen bodies in a part of this ship that's not supposed to exist. Amy, a girl that was woken up years before she is supposed to teams up with Elder to discover just what exactly is wrong. This to me is what makes the entire story and I'm glad. For once the romance wasn't fueling this amazing story. The mystery was hidden underneath the secrets of the ship and were slowly revealed. At points in the novel you can't help but to just set it down and mull over it and try and grasp what's really happening. I mean, I couldn't believe what was happening and when Eldest finally reveals what's been going on you going into a state of shock. Well... I did at least. The entire book kept me on edge and literally wouldn't let me put it down before I figured out the ship's secret. It's a MUST READ!!!! Cover/Read: This is by far my favorite book cover so far this year and possibly ever. It's amazing.